Mallam Aminu Kano International Airport (IATA: KAN, ICAO: DNKN) is an airport serving Kano, the capital city of Kano State of Nigeria. It was a Royal Air Force station before the country became independent. 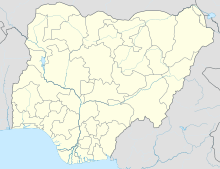 It is the main airport serving northern Nigeria and was named after politician Aminu Kano. Mallam Aminu Kano International Airport is the oldest in Nigeria and the first aircraft landed in Nigeria was landed in Kano 1922,with operations starting in 1936. In the first decades of operation, it became an important fuel stop for airlines flying long-haul services between Europe and Africa. Newer aircraft did not need such fuel stops and, with the demise of the Kano economy in the late 20th century, many international airlines stopped serving the airport. When they indefinitely suspended services to Kano in June 2012, KLM was the only European airline serving Kano, which they had done without interruption since 1947. The bulk of international flights cater to the large Lebanese community in Kano and Muslim pilgrimages to Mecca. The airport serves civilian and military flights. Runway 06/24 is mainly used for civilian flights, while runway 05/23 primarily serves the Nigerian Air Force base at the south side of the airport. Runway 05/23 was in use for all operations when the main runway was rehabilitated in the beginning of the 21st century. The terminal facilities lie between the two runways. The Kano VOR-DME (ident: KAN) and non-directional beacons (idents: KO and AO) are located on the field. The main terminal with the control tower serves international flights and domestic services operated by Arik Air. Facilities in the departure lounge are minimal, with a newsstand near the check-in counter and a small bar at airside. There is a small VIP lounge for business class passengers. Duty-free shops are currently closed. There is a small bar and a post office in the arrivals hall. On the south side of the airport, along runway 06/24, is the domestic terminal currently serving operations of IRS Airlines. Facilities include a newsstand and small bar. Construction of a new domestic terminal, adjacent to the main terminal building, started in the beginning of the 21st century. Construction was abandoned but was resumed. The operator of the airport, Federal Airports Authority Nigeria (FAAN), saw the completion of the new terminal in November 2009. It was commissioned on May 2011. On 24 June 1956, a BOAC four-engine Canadair C-4 Argonaut airliner crashed on departure from Kano International. Of the 45 passengers and crew on board, only 13 survived. On 22 January 1973, the Kano Air Disaster occurred - an Alia Boeing 707-320C crashed at Kano International while attempting to make a landing in high winds. 176 of the 202 passengers and crew on board were killed. It was and remains the worst aviation disaster in the history of Nigeria. On 4 May 2002, EAS Airlines Flight 4226, a BAC 1-11-500 twin-engine jet crashed upon take-off from Mallam Aminu Kano International Airport, killing 71 passengers and crew on board as well as 78 more on the ground into whose houses the plane had crashed. ^ Airport information for DNKN at World Aero Data. Data current as of October 2006.Source: DAFIF. ^ Airport information for KAN at Great Circle Mapper. ^ "KANO INTERNATIONAL AIRPORT – From Grace to Grass and Back Again". JetLife Nigeria. 10 July 2013. Archived from the original on 3 March 2015. ^ "Kano NDB (KO) @ OurAirports". ourairports.com. Retrieved 21 August 2018. ^ "Kano NDB (AO) @ OurAirports". ourairports.com. Retrieved 21 August 2018. ^ "Kano VOR-DME (KAN) @ OurAirports". ourairports.com. Retrieved 21 August 2018. ^ "Tchadia Airlines outlines planned network from Oct 2018". routesonline.com. Retrieved 26 September 2018.